Magerealm, the hit free to play browser-based 3D MMORPG from GTArcade, is getting into the holiday spirit starting with most orange day of the year. For many, Halloween represents fun, mischief, and of course treats! So on this festive occasion, Magerealm is introducing a number of treats to the game so players can experience the delight of Halloween! - New Fashion and Wings: Fantastic new Halloween themed fashion and wings are now available in-game. Dress up for Halloween in style! 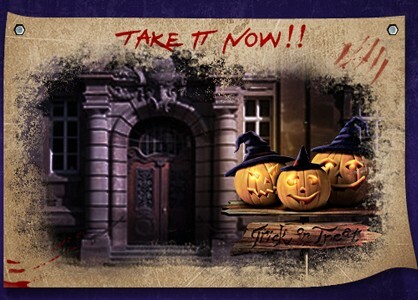 - Trick-or-Treat: One of the most popular Halloween activities comes to Magerealm! Pick a door and see if a tasty treat or a spooky trick is waiting behind it. But don’t worry, even getting tricked has its rewards! - Halloween Spree: Big item packages will be available for purchase at huge discounts as part of the Halloween spree. Don’t miss out on the savings! - Realm Patron: Starting Oct 29th, players can become Realm Patrons to support the restoration of the City. When players earn specific resources throughout the game, they will earn points and be ranked among others. Get rewarded for just playing! - Forum Avatar contest: Visit the official Magerealm forums and partake in this community event for Halloween. Let your creativity run wild and earn some great rewards! Join the fun and celebrate Halloween with Magerealm! For more details, visit Magerealm’s Halloween Event page at http://mage.gtarcade.com/halloween. Look forward to more holiday events coming soon!